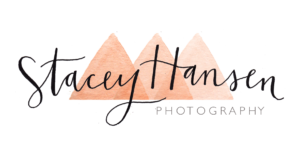 Your Session with Stacey Hansen Photography is an investment. I personally believe photos should not be outrageously expensive. I want my clients to afford their photo session AND then afford to print those photos and show them off in their homes. Nothing makes me more happy than to see my clients showcasing their family or newborn photos in their homes for everyone to see. After-all, a picture is worth a thousand words. All our sessions require a $25 deposit. Deposits are included in the total session amount. Sessions are charged 6.6% sales tax. Newborn photos typically from 4 days to 14 days old. This price includes up to 2 hours in my home studio, 40+ edited photos and print release. Typically 2 fabric poses and 2 props. If you want additional Props/poses on fabrics above the 4 listed those cost extra. Parents and siblings can be included at an additional $40 charge and give you an additional 10-15 images. Travel to your house is available at an extra $35 charge. Additional Information is available. Contact me to discuss. *Birthstories are listed at the bottom of this page! A mini Newborn Session is perfect to just get one pose for a birth announcement. You help pick the color scheme based on your nursery or favorites and I pick the set up, props and pose. Up to 30 minutes, 20+ edited photos, online gallery, print release. (CD/DVD is NOT included but can be purchased for $5 extra. Pick up only or extra charge for mailing/shipping of CD/DVD). Parents and Siblings CAN NOT be added to this option. Cake Smash Sessions are so much fun! This session includes up to 1 hour of session time, 2-3 outfits, full cake smash set up and the Cake! 40+ edited photos in online gallery and print release. CD/DVD's are provided upon request and for pick up only. Mailing/Shipping is an Extra Charge. We may provide 4-6 balloons to match your set up if requested and those colors are available in our stock. *Twins can be included in this package for $45 extra to cover the second cake. **Mini Cake Smash Sessions are available for $120. This price includes the cake smash pictures only, up to 30 minutes, 30+ photos in an online gallery with print release. NO CD of photos is provided. You provide the cake, any banners or decorations you want as well as the balloons. Additional people may be added for $8 each. Full sessions are awesome for family sessions but can also be used for seniors, kids, engagements, etc. Includes 1 location of your choice, up to 1 hour of session time, up to 10 people, 50+ edited photos on disk/drive, and print release. This session is only available to immediate families, no extended families. CD/DVD's are provided upon request, up to 3 and for pick up only. Shipping/mailing the CD/DVD is extra. Additional People may be added for $15 a person. Other changes or custom packages are available. This package is good for extended families. Includes 1 location of your choice, up to 2 hours, up to 30 people, 75+ edited photos, online gallery and print release. Up to 8 DVDs provided upon request. Your child's first year is going to go by so fast! Savor all each step of them changing and growing with a First Year Grow with Me Package. This package includes sessions at 6, 9 and 12 months. You'll get a 15 minute session for the 6 and 9 months and a full hour session for the 12 month/1 year pictures with Cake Smash. I provide the Cake, you just tell me what you'd like on it. You'll get an online album for each session with downloadable high resolution photographs and a Disk with all sessions after the 1 year session. You'll get 15-20 pictures at each of the 6 and 9 month sessions and then 50+ at the 12 month. (You can trade the 9 month session for an 18 month session if you wish). Sessions are 15 minutes only - You can use TWO outfits per session for the 6 and 9 months. 5 themed sessions throughout 2019 - Valentine's Day, Easter, Summer, Halloween and Christmas. For $200 you get five 15 minute mini sessions which means you are getting an amazing deal! They are all themed with a fun set up and you just show up and take your pictures. This price is good for one or two kids from an immediate family. Additional kids are an extra $25 each for the entire year. Each session will come with an online gallery and print release. **Another option is to upgrade to our Themed Mini Package 2 for $245 - This includes Valentine's, Spring/Easter, Halloween, Christmas and a SUMMER MINI SESSION that you can use how you want! A mini Family Session , a fun summer oufit outdoors etc. A normal mini is $125 by it's self so that's an amazing deal! We provide individual themed mini sessions for Valentine's, Spring/Easter, Halloween and Christmas. Sessions are 15 minute sessions and include whatever backdrop we have set up for that theme. We rotate from simple set ups to elaborate props, etc. Session examples and flyers are posted on our Facebook and Instagram pages when we are ready to book each type of session. Online Gallery and Print release are provided. DVD can be purchased for $5 extra. Birth Stories are the new trend in photography and I have to say I'm truly blessed to witness such miracles. Let me be apart of your delivery and capture your precious moments in those first few minutes, days and your journey on how you got there. These Birth Story Packages help you cherish those memories. **All Birth Stories require a deposit equal to half the package price you purchase. The remaining balance is due at the time of your newborn session but before your photos are delivered for your birth story session. Hospital/Birth Coverage - up to 3 hours prior to delivery and only 1 hour after delivery. Additional Time is EXTRA and billed at $100 per hour. Hospital/Birth Coverage during delivery only - up to 3 hours prior to delivery and only 1 hour after delivery. Additional Time is EXTRA and billed at $100 per hour. Hospital/Birth Coverage during Delivery only - 3 hours prior to delivery and limited to 1 hour after delivery. Additional time is EXTRA and billed at $100 per hour.